Alex joined the firm in 2000 and specialises in general commercial litigation and has particular experience with contractual disputes, financial services disputes, professional negligence, commercial agency disputes and IT disputes. Clients have included banks, building societies and title insurers working on disputes arising out of mortgage fraud and also in relation to disputes with agents and appointed representatives. Alex has developed particular experience and knowledge of the retail sector and advised on high-value complex disputes relating to procurement of software, services, recruitment and goods. He has spent 18 months on a part time secondment to a large client. Alex holds the full Financial Planning Certificate (FPC 1, 2 and 3) and is a practising mediator accredited by the ADR group and the Law Society Civil and Commercial Mediation Accreditation Scheme. According to the Chambers UK, 2016 “Clients laud him as ‘tenacious and thorough. 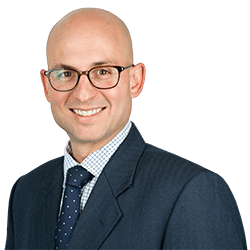 He always provides the feeling that he is firmly trying to get you the best outcome possible’.” Legal 500 2017 notes that Alex is “‘very professional’ and ‘accurate as well as circumspective’”. He is a member of the Association of South West Mediators. Acting for a large supermarket chain in a dispute with a US software provider arising out of the unsuccessful purchase and implementation of promotional forecasting software. A claim was issued against the client for damages arising out of alleged wrongful termination of software hosting and maintenance contracts. The client defended the claim and brought a counterclaim for losses of circa £3.5 million arising out of the software provider’s breaches of contract which led to the failure of the project and termination by the client. The matter settled on confidential terms. Acting for a bank against a firm of surveyors in a claim for circa £5.5 million arising out of a fraud on the bank. Involved issues of professional negligence, fraud and insurance coverage. Secured judgment for the full amount of the claim and then successfully pursued the insurer for recovery under the Third Parties (Rights Against Insurers) Act 1930. Liaised with the Police and CPS in order to secure compensation for the bank in its capacity as a victim of the crime under the Powers of Criminal Conduct (Sentencing) Act 2000 and enforced against assets seized by the crown under the Proceeds of Crime Act 2002. Claim against a firm of accountants for failure to advise the client properly in relation to an Employee Benefit Trust. The Claimant suffered losses to the tune of £2 million. The negligence lay in the defendants’ failure to advise the client to reserve for a potential tax liability subject to the outcome of the then ongoing and high profile case of MacDonald v. Dextra Accessories Ltd. The matter settled on confidential terms. Acting for a drinks supplier in a claim for circa £8.5 million arising from losses incurred as a result of a product recall. Acting on behalf of the vendors of a company which manufactured precision medical equipment in a claim brought against them for breach of warranty. The client counterclaimed for the remainder of the purchase price and joined its former auditors into proceedings. It made no payment in the claim and recovered a substantial sum from both the purchaser and the auditors.